The Landsat mission is one the most successful remote-sensing programs and has been running since the early 1970s. The most recent addition to the flock of Landsat satellites – Mission Nr. 8 has been supplying tons of images to researchers, NGO’s and governments for over two years now. Providing nearly 400 images daily (!) this has amassed to an impressive dataset of over half a million individual images by now (N = 515243 by 29/07/2015). Landsat 8 scenes can be easily queried via a number of web-interfaces, the oldest and most successful being the USGS earth-explorer which also distributes other NASA remote-sensing products. ESA also started to mirror Landsat 8 data and so did the great Libra website from developmentseed. Using the Landsat8 before/after tool from remotepixel.ca tool you can even make on the fly comparisons of imagery scenes. You might ask how some of those services are able to show you the number of images and the estimated cloud-cover. This information is saved in the scenes-list metadata file, which contains the identity, name, acquisition date and many other information from all Landsat 8 scenes since the start of the mission. 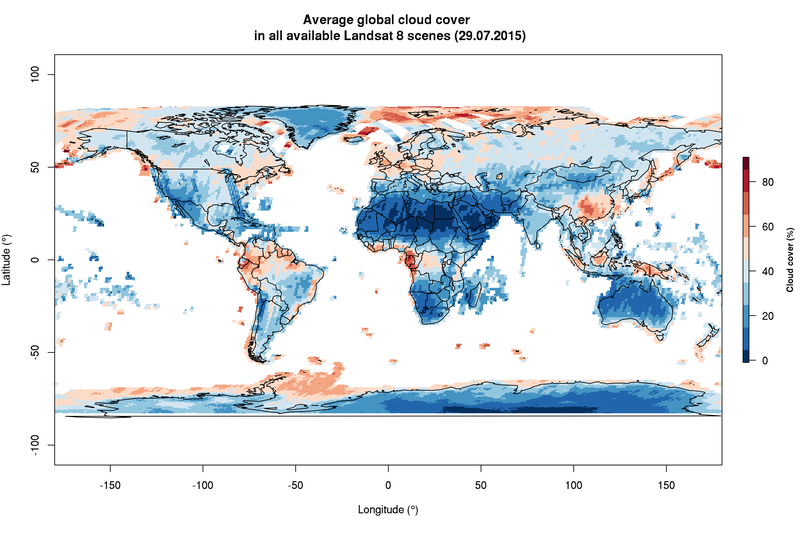 In addition Landsat 8 also has a cloudCover estimate (and sadly only L8, but the USGS is working on a post-creation measure for the previous satellites as far as I know), which you can readily explore on a global scale. Here is some example code showcasing how to peek into this huge ever-growing archive. Now you can read in the resulting csv. For speed I would recommend using the “data.table” package! The metadata file contains quite a number of cool fields to explore. For instance the “browseURL” columns contains the full link to an online .jpg thumbnail. Very useful to have a quick look at the scene. Clouds are a major source of annoyance for anyone who intends to measure vegetation cover or classify land-cover. Might write another post later showcasing some examples on how to filter satellite data for clouds. Since quite some time ecological models have tried to incorporate both continuous and discrete characteristics of species into their models. Newbold et al. (2013) demonstrated that functional traits affect the response of tropical bird species towards land-use intensity. Tropical forest specialist birds seem to decrease globally in probability of presence and abundance in more intensively used forests. This patterns extends to many taxonomic groups and the worldwide decline of “specialist species” has been noted before by Clavel et al. (2011). But how to acquire such data on habitat specialization? Ether you assemble your own exhaustive trait database or you query information from some of the openly available data sources. One could for instance be the IUCN redlist, which not only has expert-validated data on a species current threat status, but also on population size and also on a species habitat preference. Here IUCN follows its own habitat classification scheme ( http://www.iucnredlist.org/technical-documents/classification-schemes/habitats-classification-scheme-ver3 ). The curious ecologist and conservationist should keep in mind however, that not all species are currently assessed by IUCN. letsR also has other methods to work with the spatial data that IUCN provides ( http://www.iucnredlist.org/technical-documents/spatial-data ), so definitely take a look. It works by querying the IUCN redlist api for the species id (http://api.iucnredlist.org/go/Telophorus-viridis). Sadly the habitat function does only return the information if a species is known to occur in a given habitat, but not if it is of major importance for a particular species (so if for instance a Species is known to be a “forest-specialist” ). Telophorus viridis for instance also occurs in savannah and occasionally artificial habitats like gardens ( http://www.iucnredlist.org/details/classify/22707695/0 ). So I just programmed my own function to assess if forest habitat is of major importance to a given species. It takes a IUCN species id as input and returns ether “Forest-specialist”, if forest habitat is of major importance to a species, “Forest-associated” if a species is just known to occur in forest or “Other Habitats” if a species does not occur in forests at all. The function works be cleverly querying the IUCN redlist and breaking up the HTML structure at given intervals that indicate a new habitat type. How does it work? You first enter the species IUCN redlist id. It is in the url after you have queried a given species name. Alternatively you could also download the whole IUCN classification table and match your species name against it 😉 Find it here. Then simply execute the function with the code. Today we are gonna work with bulk downloaded data from MODIS. The MODIS satellites Terra and Aqua have been floating around the earth since the year 2000 and provide a reliable and free-to-obtain source of remote sensing data for ecologists and conservationists. 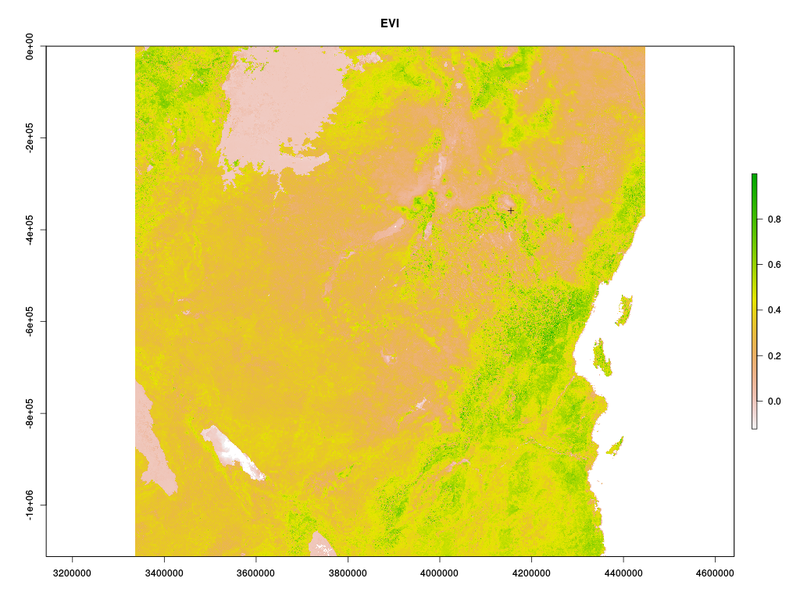 Among the many MODIS products, Indices of Vegetation Greenness such as NDVI or EVI have been used in countless ecological studies and are the first choice of most ecologists for relating field data to remote sensing data. Here we gonna demonstrate 3 different ways how to acquire and calculate the mean EVI for a given Region and time-period. For this we are using the MOD13Q1 product. We focus on the area a little bit south of Mount Kilimanjaro and the temporal span around May 2014. The first handy R-package we gonna use is MODISTools. It is able to download spatial-temporal data via a simple subset command. The nice advantage of using *MODISTools* is that it only downloads the point of interest as the subsetting and processing is done server-wise. This makes it excellent to download only what you need and reduce the amount of download data. A disadvantage is that it queries a perl script on the daac.ornl.gov server, which is often horrible slow and stretched to full capacity almost every second day. If you want to get whole MODIS tiles for your area of interest you have another option in R available. The MODIS package is particularly suited for this job in R and even has options to incorporate ArcGis as path for additional processing. It is also possible to use the MODIS Reprojection Tool or gdal (our choice) as underlying workhorse. # And extract the mean value for our point from before. If all the packages and tools so far did not work as expected, there is also an alternative to use a combination of R and Python to analyse your MODIS files or download your tiles manually. The awesome pyModis scripts allow you to download directly from a USGS server, which at least for me was almost always faster than the LP-DAAC connection the two other solutions before used. 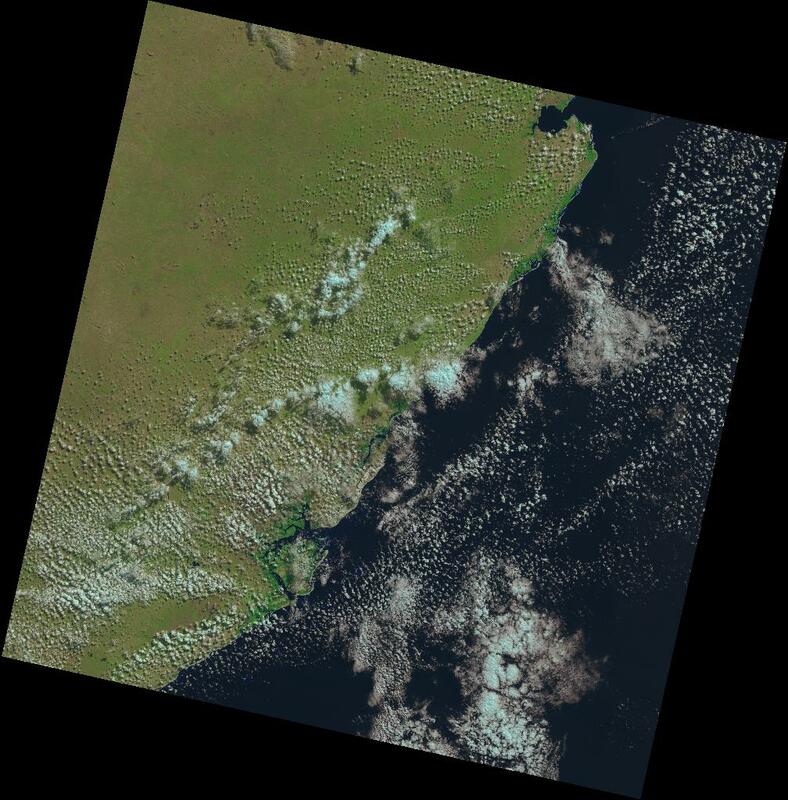 However up so far both the MODISTools and MODIS package have processed the original MODIS tiles (which ship in hdf4 container format) for you. Using this solution you have to access the hdf4 files yourself and extract the layers you are interested in. Here is an example how to download a whole hdf4 container using the modis_download.py script Just query modis_download.py -h if you are unsure about the command line parameters. # Now we are dealing with the original hdf4 files. Hey, it has been over 2 months, so welcome in 2014 from my side. And i am sorry for not posting more updates recently, but like everyone i was (and still am) under constant working pressure. This year will be quite interesting for me personally as i am about to start my thesis project and will (besides other things) go to Africa for fieldwork. But for now i will try to catch your interest with a new macroecology playground post dealing with the important issue of spatial autocorrelation. See the other Macroecology playground posts here and here for knowing what happened in the past. Spatial autocorrelation is the issue that data points in geographical space are somewhat dependent on each other or their values correlated because of spatial proximity/distance. This is also known as the first law of geography (Google it). However, most of the statistical tools we have available assume that all our datapoints are independent from each other, which is rarely the case in macroecology. Just imagine the steep slope of mountain regions. Literally all big values will always occur near the peak of the mountains and decrease with distance from the peak. There is thus already a data-inherent gradient present which we somehow have to account for, if we are to investigate the effect of altitude alone (and not the effect of the proximity to nearby cells). 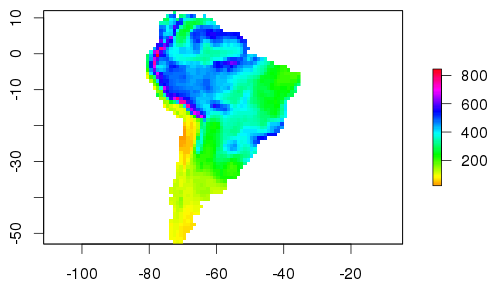 In our hypothetical example we want to explore how well the topographical average (average height per grid cell) can explain amphibian richness in South America and if the residuals (model errors) in our model are spatially autocorrelated. I can’t share the data, but i believe the dear reader will get the idea of what we are trying to do. # Load in your dataset. In my case i am loading both the Topo and richness from a raster stack. What did we do? As you can see we fitted a simple linear regression model using the values from both the amphibian richness raster layer and the topographical range raster. The relation seems to be highly significant and this simple model can explain up to 12.4% of the variation. Here is the basic plot output for both response and predictor variable. As you can see high values of both layers seem to be spatially clustered. So the likelihood of violating the independence of datapoints in a linear regression model is quite likely. Lets investigate the spatial autocorrelation by looking at Moran’s I, which is a measure for spatial autocorrelation (technically its just a determinant of correlation that calculated the pearsons r of surrounding values within a certain window). 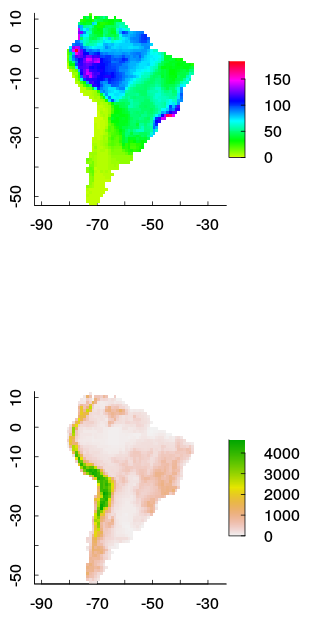 So lets investigate if the residual values (the error in model fit) are spatially autocorrelated. system.time(co <- correlog(x,y,z,increment = 100,resamp = 0, latlon = T,na.rm=T)) # this can take a while. Ideally Moran’s I should be as close to zero as possible. In the above plot you can see that values in close distance (up to 2000 Distance units) and with greater distance as well, the model residuals are positively autocorrelated (too great than expected by chance alone, thus correlated with proximity). The function correlog allows you to resample the dataset to investigate significance of this patterns, but for now i will just assume that our models residuals are significantly spatially autocorrelated. matrices that specify the strength of interaction between neighbouring sites (Dormann et al., 2007). 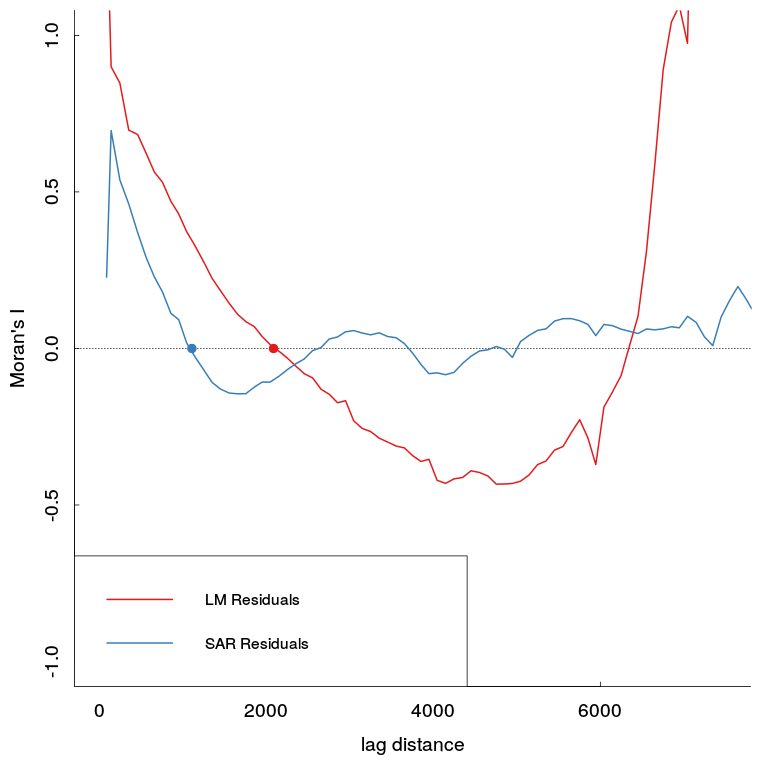 If you know that the spatial autocorrelation occurs in the response variable only, a so called “lagged-response model” would be most appropriate, otherwise use a “mixed” SAR if the error occurs in both response and predictors. However Kissling and Carl (2008) investigated SAR models in detail and came to the conclusion that lagged and mixed SARs might not always give better results than ordinary least square regressions and can generate bias (Kissling & Carl, 2008). Instead they recommend to calculate “spatial error” SAR models when dealing with species distribution data, which assumes that the spatial correlation does neither occur in response or predictors, but in the error term. 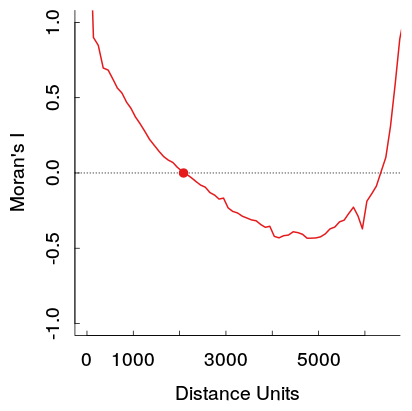 nei <- dnearneigh(cbind(x,y),d1=0,d2=2000,longlat=T) # Get neighbourlist of interactions with a distance unit 2000. # You should calculate the interaction weights with the maximal distance in which autocorrelation occurs. # But here we will just take the first x-intercept where positive correlation turns into the negative. # indicating a better fit. The SAR is one of many methods to deal with spatial autocorrelation. I agree that the choice of of the weights matrix distance is a bit arbitrary (it made sense for me), so you might want to investigate the occurence of spatial correlations a bit more prior to fitting a SAR. So have we dealt with the autocorrelation? Lets just calculate Moran’s I values again for both the old residual and the SAR residual values. Looks better doesn’t it? F Dormann, C., M McPherson, J., B Araújo, M., Bivand, R., Bolliger, J., Carl, G., … & Wilson, R. (2007). Methods to account for spatial autocorrelation in the analysis of species distributional data: a review. Ecography, 30(5), 609-628. Kissling, W. D., & Carl, G. (2008). Spatial autocorrelation and the selection of simultaneous autoregressive models. Global Ecology and Biogeography, 17(1), 59-71. Ahh, Macroecology. The study of ecological patterns and processes on big scales. Questions like “what factors determine distribution and diversity of all life on earth?” have troubled scientists since A.v.Humboldt and Wallace times. At the University of Copenhagen a whole research center has been dedicated to this specific field and macro-ecological studies are more and more present in prestigious journals like Nature and Science. Previous studies at the center have found skewed distributions of bird richness with a specific bias towards the mountains (Jetz & Rahbek, 2002, Rahbek et al., 2007). In this blog post i am going to play a bit around with some data from Rahbek et al. (2007). The analysis and the graphs are by no means sufficient (and even violate many model assumptions like homoscedasticity, normality and data independence) and are therefore more of exploratory nature 😉 The post will show you how to build a raster stack of geographical data and how to use the data in some very basic models. So here is how the head of SAM data file (“data.sam”) looks like (i won’t share it, so please generate your own data). You wanna do some modeling or extract data? Here you go. First we make a subset of some of our predictors from the raster stack and then fit ordinary least squares multiple regression models to our data to see how much variance can be explained. Note that linear regressions are not the proper techniques for this kind of analysis (degrees of freedom to high due to spatial autocorrelation, violation of assumptions mentioned before), but its still useful for explanatory purposes. While looking at the residual plot you might notice that our simple model fails to explain all the variation at mountain altitudes (the Andes). Still the predicted values look very alike the observed richness. Bird species Richness is highest at tropical mountain ranges, which is consistent with results from Africa (Jetz & Rahbek, 2002). Reasons for this pattern are not fully understood yet, but if i had to discuss this with a colleague i would probably bring up arguments like older evolutionary time, higher habitat heterogeneity and greater numbers of climatic niches at mountain ranges. At this point you would then test for spatial autocorrelation using Moran´s I, adjust your data to that and use more sophisticated methods like General Additive Models (GAMs) or Spatial Autoregressive Model (SARs) and account for the spatial autocorrelation. See Rahbek et al. (2007) for the actual study. Jetz, W., & Rahbek, C. (2002). Geographic range size and determinants of avian species richness. Science, 297(5586), 1548-1551. Rahbek, C., Gotelli, N. J., Colwell, R. K., Entsminger, G. L., Rangel, T. F. L., & Graves, G. R. (2007). 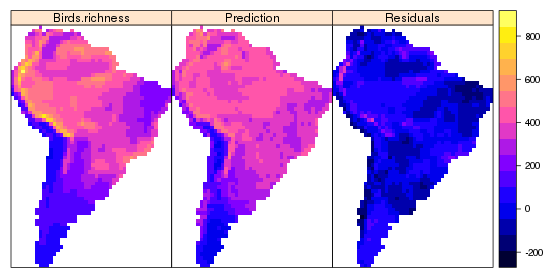 Predicting continental-scale patterns of bird species richness with spatially explicit models. Proceedings of the Royal Society B: Biological Sciences, 274(1607), 165-174. R has grown a lot in the past years and is increasingly used as GIS. For many spatial operations and even spatial statistics certain R packages are simply the best choice up to date. For instance Home-range analysis are kinda impossible to perform (at least for me) without looking at the adehabitat packages. You want to perform a spatial operation in a script and do not know how to code python: Just use R. Francisco Rodriguez-Sanchez has posted very nice examples how to perform GIS tasks completely within R.
However R as GIS lacks the simplicity in matters of design and it requires quite an effort to make a good-looking map. 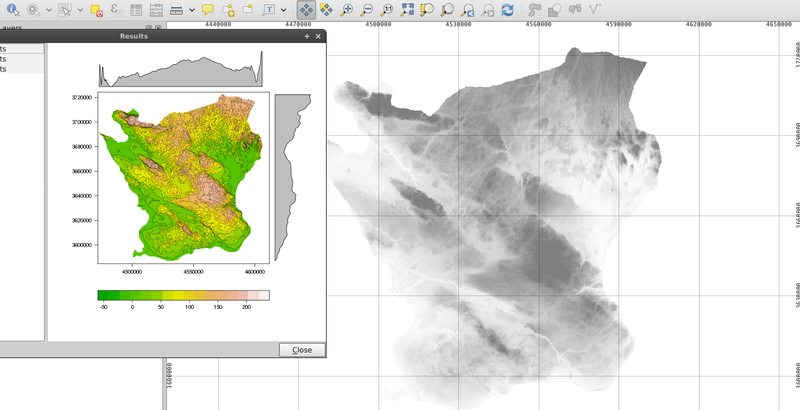 Therefore using QGIS for map-design and output is always the favored choice for me. But why use R and QGIS independently? Through the SEXTANTE Toolbox for QGIS it is possible to execute fast and precise r-scripts for your spatial data just in QGIS. Download the current QGIS dev. and R.
Enable SEXTANTE in QGIS and activate the R-scripts in the SEXTANTE options provider window. Furthermore specify a R-scripts folder where you store your scripts. Execute one of the Example R-scripts to test if the scripts are working. If the above steps all turned out as expected you could start formatting your own r-scripts into a so-called .rsx file (R SEXTANTE script). So open your favorite text-editor (or the new r-script dialog in QGIS) and create a new file. Save it into the rscripts folder inside your QGIS profile directory (“~/.qgis2/sextante/rscripts” on Linux based systems. Similar structure under Windows inside of your Documents folder). All .rsx scripts start with defining a group (where to save the script in SEXTANTE) and continue with additional inputs specified by the user. All Input data comes with two hashs in front. Furthermore you need to specify if the script output should show plots (add “#showplots” at the beginning of the script) and/or console output (start a command with “>”). After you wrote your script, startup QGIS, open the SEXTANTE toolbox and have fun executing it. All things are possible, but it isn’t really easy to debug .rsx scripts in QGIS as the output is limited and sometimes you just wonder why it isn’t working. Script is stored in the “Own Scripts” group. It just requires a raster (best is a DEM) as input. Right now this is just for show, but of course you could also generate for example contours of the raster DEM and save them in GDAL supported format after script execution. i just came around this function on the net and just want to share it. It is an R-function to roughly calculate the euclidean distance in kilometers between two points given in longitude and latitude values. It might be not too precise due to the inaccurate estimate of the earth radius (R).